Bodybuilding Supply Store | Fat Burners & Thermogenics | Washington Laboratories Garcinia Cambogia Extract with HCA, 1000 mg daily, 100% Pure and Natural Ingredients, Weight Loss Supplement for Women and Men. 60 ct Garcinia Cambogia Extract Fat Blocker and Appetite Suppressant, Made in USA using No Additives and No Fillers. 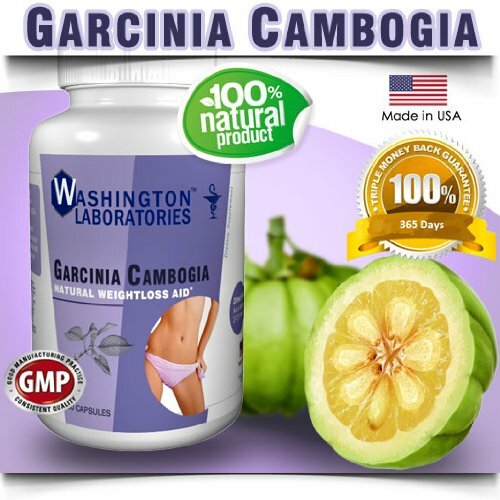 Washington Laboratories Garcinia Cambogia Extract with HCA, 1000 mg daily, 100% Pure and Natural Ingredients, Weight Loss Supplement for Women and Men. 60 ct Garcinia Cambogia Extract Fat Blocker and Appetite Suppressant, Made in USA using No Additives and No Fillers. Complete daily dosage of natural fruit extract from Garcinia Cambogia. The fruit is native to South Asia, and has been determined GRAS (Generally Recognized As Safe) by leading, independent toxicologists. The Garcinia Cambogia fruit extract is a natural weight loss aid, and works by blocking fat absorption in the body - while simultaneously suppressing appetite. It blocks fat by inhibiting an enzyme (citrate lyase) that your body needs to make fat from carbohydrates. Ideally suited for weight loss in men and women, Garcinia Cambogia works well with or without any changes to your diet. Contains 60 capsules (30 day supply) with NO fillers, NO sweeteners, and NO additives. See all Fat Burners & Thermogenics items we have to offer.